One of the first things to consider when creating a refrigerator soup is texture. Pull out all of the items you want to use, including random bits of leftover veggies, and separate them into uniform piles. Here is a plate of onions, carrots, and two different kinds of beans: haricot (skinny french bean) and yellow wax beans. 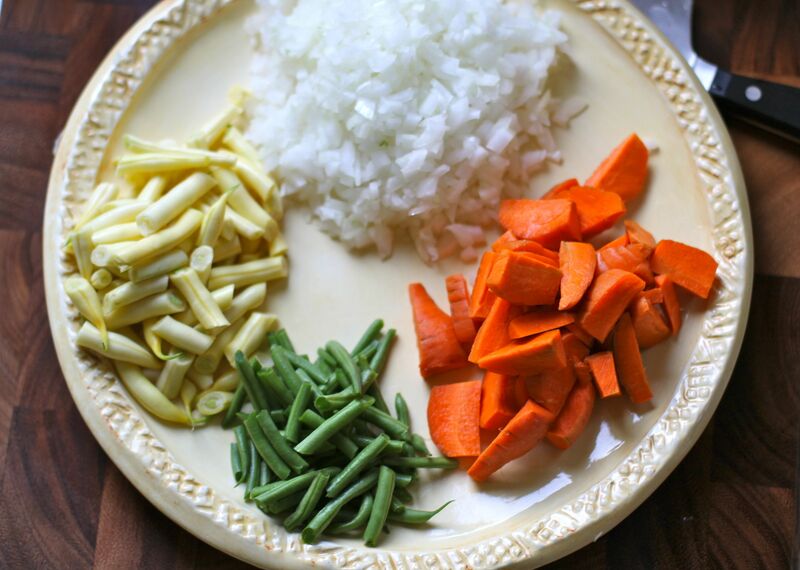 If you were to put all of these things into your soup pot at the same time, they would not cook at the same rate and you’d end up with mushy beans and crunchy carrots. 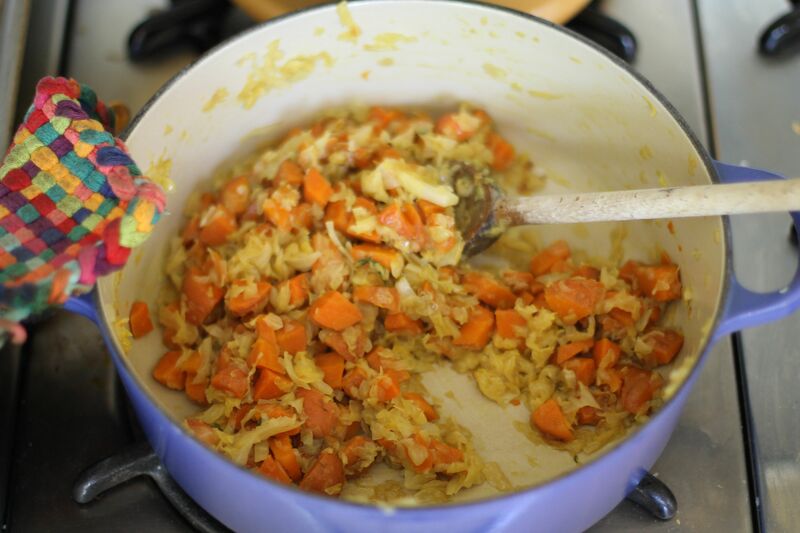 The onions and carrots can cook longer, and taste better when their flavors have had a chance to develop. The beans are much better when added toward the end of cooking so that they can retain their brightness and texture. It takes an extra moment to consider the different textures of your ingredients, but is well worth your efforts to think about how you want your final product to look and taste before you begin. Refrigerator soup tastes best when started with a flavorful base. Onions, garlic, carrots, celery, fennel, and other aromatics are a good start. I like to start with my onions first, add a hefty pinch of salt, and allow them to get really soft and sweet before adding other items like carrots. Here is a base that was started with onions. 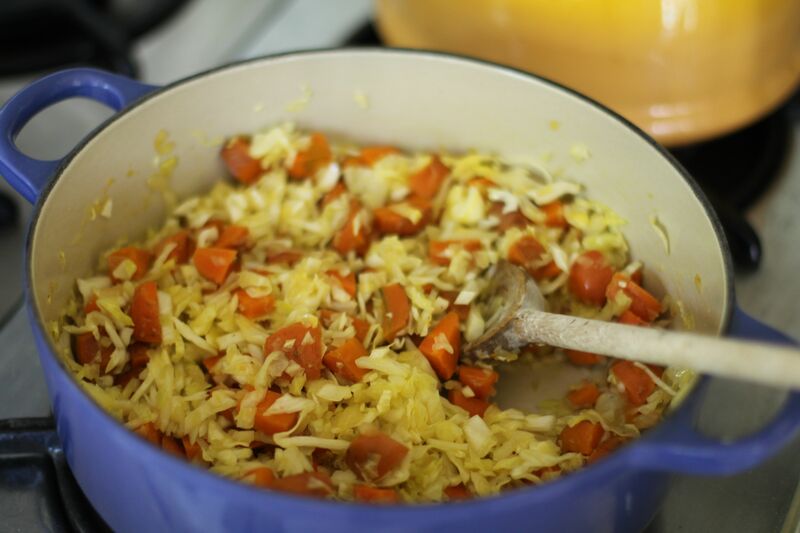 Carrots were then added and allowed to cook for a bit before I added a clove of garlic and some leftover shredded cabbage. You could add stock at this point if you were pinched for time. I was simultaneously tackling a mountain of laundry, so I allowed the cabbage to cook down and caramelize a bit before adding the stock. I also added a pinch of sugar to bring out the natural sweetness of the cabbage. Now it’s time to add stock (or water) and add-ins, like lentils, green beans, or greens. At this point, it’s good to consider your textures: if you’re using dried legumes, like lentils, you’ll need to figure in about 30 minutes of cooking time to soften the lentils. If you want to add dried beans, like chickpeas, it’s best to use already cooked. You can use rinsed chickpeas from a can if you don’t have fresh on hand. Fresh items like green beans, yellow wax beans, or fresh greens like spinach should all be added later on to help retain their crunch and beautiful color. In the picture on the right, you can see that I took all the leftover Vietnamese spinach and separated it into different parts: stems, leaves, and flowers. Each had a different texture, thus requiring a different amount of time to cook. The stems were similar to the green and yellow wax beans, so I added them into the soup at the same time. The spinach leaves are more delicate and soften quickly in the hot broth, so they went in a couple of minutes before we were ready to eat. The flowers were crunchy but beautiful, so I decided to save them as a garnish. Another great flavor booster for soup is a leftover parmesan rind, which adds a savory saltiness to your broth. 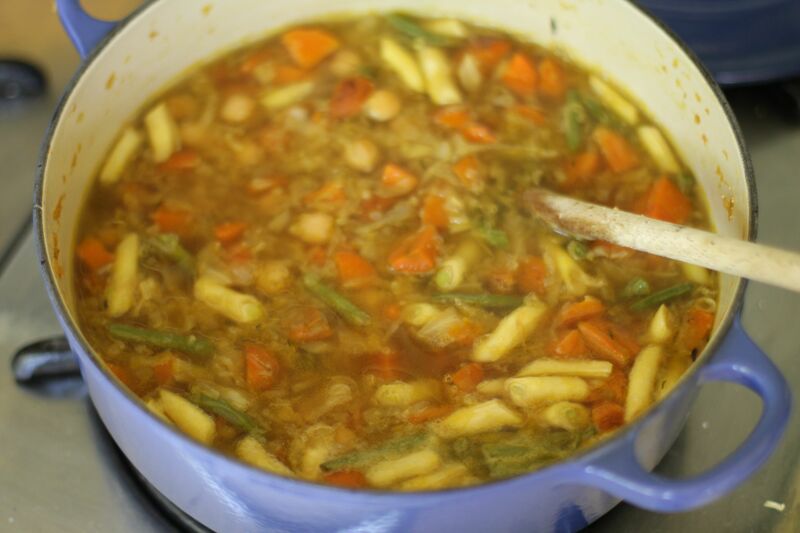 Toss in your parmesan rind when you pour in the stock and allow it to simmer alongside your beans and/or heftier veggies. 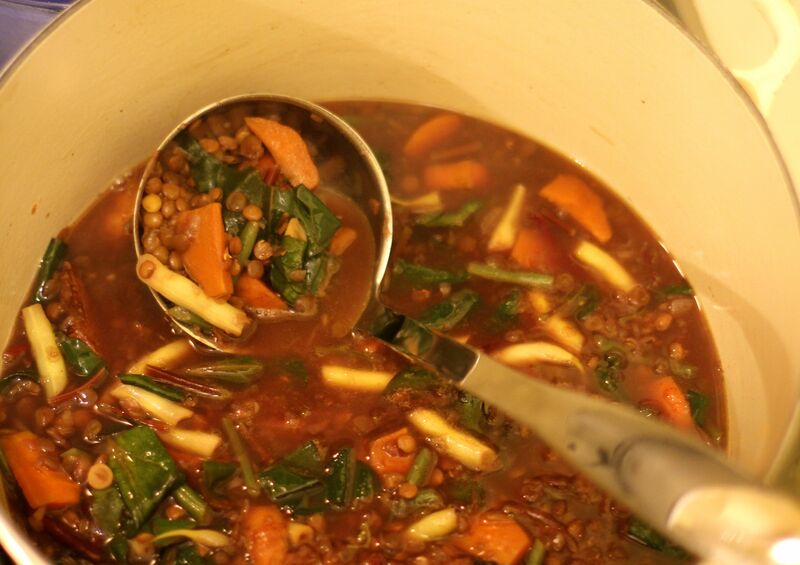 When you think the soup might be ready, give it a taste and ask yourself: “What does it need?” When I made the lentil soup with Vietnamese spinach, I tossed in a parmesan rind to simmer alongside the lentils, so the stock was very flavorful on its own. I added the beautiful Vietnamese spinach flowers as a crunchy garnish, which was a nice textural counterpoint to the soft, cooked veggies and lentils. However, when I made the refrigerator soup with chickpeas and amaranth, it tasted too vegetal, aka too healthy. It needed something…a kick of flavor, a pop of brightness. 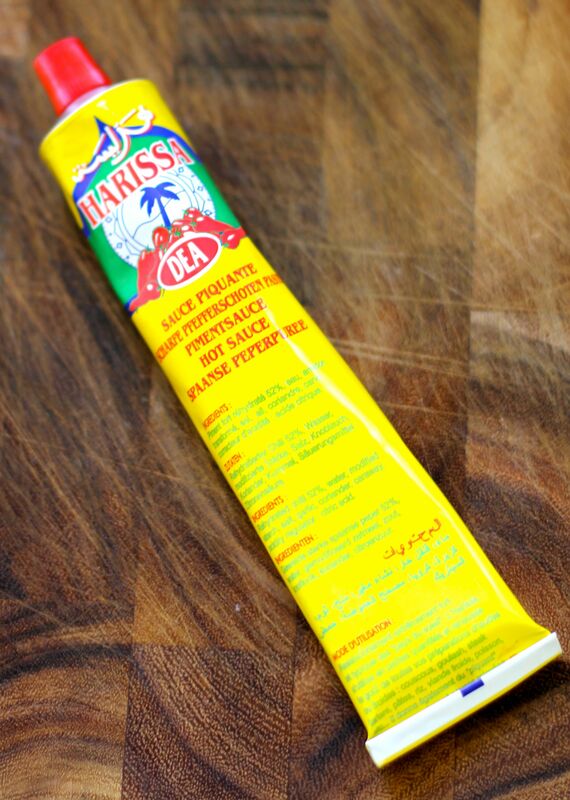 I consulted my pantry and found a tube of harissa, which is a North African spice paste. You can buy it at most well-stocked markets, or make your own. Before serving, I added a good squeeze of harissa (which can be quite spicy, so go easy at first!) and the juice of half a lemon. It was just what the soup needed – a burst of flavor – to make it taste bright, fresh, and delicious. If your soup still feels boring, check out this post one one of my favorite blogs, Eating Made Easy. She gives some great tips on how to achieve the flavor you’re searching for. I hope these tips inspire you to create a delicious soup from leftovers in your fridge and items in your pantry. We’d love to hear about your adventures! Great tips and I want a bite!